This here will be about the coup d’etat in Rwanda in 1973 and the aftermath after it. This information found on WikiLeaks is interesting. Also the way they described the matters and actions on the ground. The way the President Kayibanda lost his power and how the new President Habyarimana took over. Enjoy! In the Kibuye area there has been huts burning, reports are up to 500 peoples have been killed. Some estimates less and that there has been killed 200 people. On the 9th of March President Gregoire Kayibanda was tired and irritated while meeting with Nuncio at Gitarama. The irritation comes from the envoy from Nyerere that is Nyakyk – that is insisting that all the Tutsi’s should return home. There been Second General Ntalikure that Nyakyk can watch over the countryside with a car to monitor the situation (WikiLeaks, 1973). On the 23. March 1973 President Kayibanda comments on recent actions in the country. He issued a statement on radio where he thanked the authorities for their actions. The president focused on that it needed discipline and disloyal acts will be punished. Also talk of Coup d’etat is pointless (WikiLeaks, 1973). In May in 1973 the situation in Burundi escalated so much that Kayibanda sent minister of international cooperation departed from Kigali in 15th May on a plane to Goma and passing towards to Kinshasa. So that the Government of Rwanda can send a message to Mobutu that they fear for retaliation for the Rwanda refugee attack. Mobutu will understand Government of Rwanda’s innocence while Idi Amin in Uganda will promise to assist Burundi. The Belgian sent two Belgians to Northern Burundi and has reports of killings with arrows and machetes about 50 Tutsi’s and these insurgents are going to Ngozi. The Burundian Refugee Group has entered the country via Butare, this group is supposed to lead by former Burundi Gendarmarie officer (WikiLeaks, 1973). Spokesman Mandrandele told that Mobutu had a message for Rwanda and Burundi. That Mobutu will mediate between President Kayibanda and President Micombero in the coming OAU. Also with the knowledge of knowing that Amin will intervene on Burundi’s side. Mobutu is clear that no international force should trespass on Zarian National Land or Air space (WikiLeaks, 1973). Since 25th May the Rwandan radio responded to the attacks calling the Burundian population to liberate themselves. Also the Rwandan radio warned the Government of Burundi to do anything to Rwanda territory. The editorials that the Rwandan radio broadcasted lasted 20 minutes essays that was broadcasted from 25th until the 29th May. Papal Nuncio went to Europe after receiving information that Burundi had sent assassins to terminate him. He went the 24th May. There has also been reported that Perraudin a former secretary to Kayibanda has encouraged that Radio Burundi charged him with killing Tutsis in Rwanda (WikiLeaks, 1973). The Government of Rwanda has dismissed early 5th July the National Guard. Former President Kayibanda is under “protection” and he is now ousted as chief of state. The General Habyarimana and a high command are running the government. At 1130 the diplomatic missions where invited to give a communique that the guards main point of this change of government was to prevent a “blood bath”. All is silent in Kigali though there is a presence of armed soldiers and especially around the houses of ministers (WikiLeaks, 1973). The Church in Rwanda had issues with President Kayibanda so on 10. July 1973 the principal priest of Kabgayi (Gitrama) Archdiocese have accepted the guards takeover. This priest turned against the devoted catholic Kayibanda. This also happens with ethnic violence that happens last February and March. CRS Director a French man claims that 100% of the people is happy with the change (WikiLeaks, 1973). 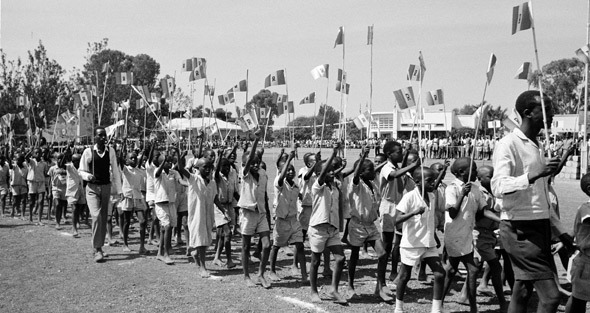 After the plan the Belgium mission to Burundi will quit by September 1973. Later the Belgium mission in Rwanda it will stop by the late 1974. Their primary reasons for this the Belgians feels that in both countries there is actively engaged in genocide. They also feel that they can’t be a part of the atrocities happing in both countries. The Belgian military is no longer advising any of the partners (WikiLeaks, 1973). Now Court Martial has ended. Finally has the Military Court found former President Kayibanda and six former comrades has been also found guilty. They are former State Secretary Nyilibakwe, former Secretary General President Ntalikure, former Director General President Hodari, former Director President Gasamunyiga and Lieutenant Habimana. This sentencing are now before President Habyarimana, that will shortly making an announcement which also will be around the time for the one-year anniversary of the coup d’etat that was on the 5th July. The problem for President Habyarimana is that for some ex-president Kayibanda is seen as father of the country. And it would be seen and be seen by the outside world as a political crime if he execute the ex-president (WikiLeaks, 1974). On the 5th July President Habyarimana the decision to act on the death sentence of former President Kayibanda. The spirit of the day is supposed to be “reflection and national reconciliation”. In the speech on the radio he introduced it as the second republic. The president also promised that political activities will be by 1978 (WikiLeaks, 1974). First to see the context is that the country is ruled with Authoritarian Social tradition and secondly is the issues of the revolution in 1959 – 1961 that ended the 400 year old feudal power structure. That has made changed to society in Rwanda. This has substituted the rule of the majority of the Hutu’s with the minority rule of the Tutsi. Tutsi’s are the losers, they lose their land and homes. Which forces the Tutsi’s into exile. One of the first actions that President Habyarimana took power after sentenced 30 former key members of the former regime. The Coup makers claimed that the former President Kayibanda made ethnic tensions in the country because of the massacres of the Hutu in Burundi in 1972. So now there are now no elections, but local community councils are chosen by a non-partisan vote. President Habyarimana is friends with Mobutu in Zaire and imitates his “Grand Chef” authoritarian style. Still he has a better relationship with Burundian counterpart Bagaza. They also will be a part of Human Rights international because this will open up to donors and aid dollars to the Government of Rwanda. Even though they do this still there are the legal standards in a modern sector. Like violations of prostitutes in Kigali that are rounded-up without due-process. Migrants from rural areas are uprooted from the capital and sent home. President Habyarimana has a five year plan to fix the food security and production in the country. Including in the health, housing, education in the rural areas where 97% of the peoples live. 19% of the budget of the Government of Rwanda goes to the Defense which is mostly to salaries to soldiers (WikiLeaks, 1977). After three years of implementation of the Communal labor (Umuganda) ministry of plan has said it need more to meet the development needs. The works will focus on the works happening in the areas of hilly Gisenyi and Gikongoro prefectures. They also work for Kigali civil servants, on of the chief activities is to actually making brick manufacturing, fixing roads and coffee cultivation near the Kigali Airport. The minister said that this works was essential to the development of Rwanda. Burgomasters in the rural areas focus on persuasion for the workers then essential to encourage participating in the works. Rwandan Government has rewarded the Communal workers with cutting the work week of its employees from 49hours to 46,5 hours which includes 5 hours of communal labor. The Rwandan Coffee Board – OCIR is giving the producers of green coffee a greater price on it from 80 to 120 Francas a kilo. This is happening because the neighbors of the raise of prices in Zaire and Burundi. The fear from OCIR is that the bigger prices in the other countries they fear that the produce will migrate across the borders (WikiLeaks, 1977).